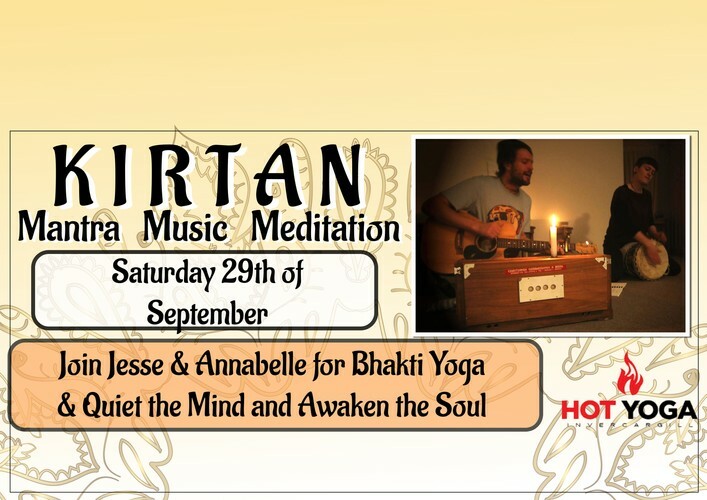 Kirtan is a type of Yogic Meditation, singing simple mantras in a call and response format. As a group, practitioners begin to focus on the collective sound and experience, as a result, the distraction of worldly affairs from the past and future begin to fall away. We move into a more harmonious state, connected with the present moment. Annabelle and Myself, Jesse will guide you through the practice, explaining the meaning of mantras, and use a PowerPoint show for lyrics and art. We play on a harmonium - a magical sounding instrument popular in India, as wells as guitar, hand drum, leading the singing, and provide simple rhythmic instruments for anyone to use. Describing the effect of the ancient practice of Kirtan is as difficult as describing a colour or taste. Simply open to the experience and feel it for yourself. People and groups often respond in different ways, sometimes kirtan can be an inward journey of self-discovery, an emotional release of tears, joyous singing and clapping, or even turn into a dance party. Only through trying new experiences can we expect to bring about change in our life, shedding social and cultural differences we find opportunity an growth.